This was the news that Volkswagen AG was considering changes to its management structure. 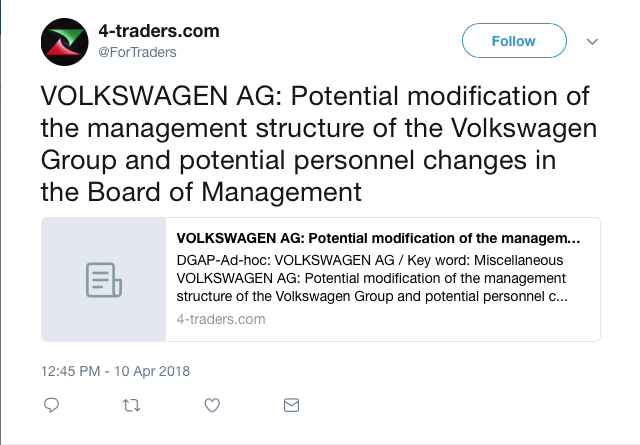 Volkswagen AG put out a press release at 13:35 CET/12:35 BST Tuesday April 10th. Given the recent Volkswagen “dieselgate” scandal, this had the potential to be a major news story that would impact Volkswagen AG’s share price. This news first hit Twitter in a post by DGAP News International – a German stock news feed - at 12:38 on Tuesday April 10th. This was almost immediately picked up by 4-traders.com (@ForTraders) which tweeted a link to the DGAP article at 12:45 (above). It was this Tweet that EarlyBird’s Volkswagen SmartTracks identified as financially relevant – as you can see from the timeline of EarlyBird’s Volkswagen SmartTrack below. 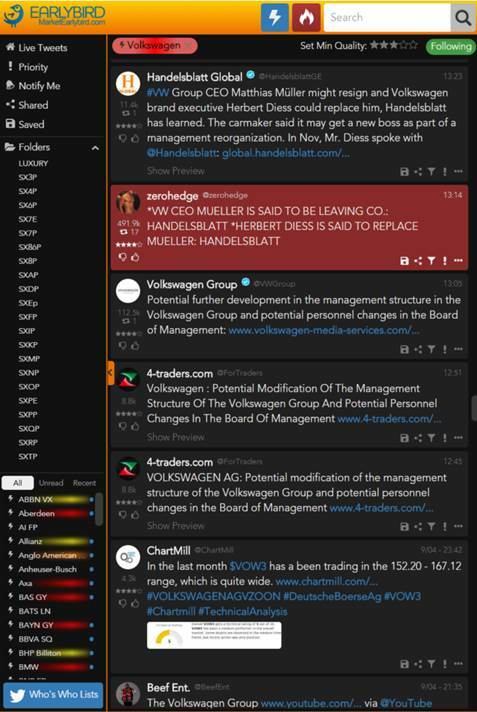 Reuters posted an article about the story at 12:52, which was the first mention of the story in the Frankfurt Stock Exchange news feed – that’s where Volkswagen shares are traded. As you can also see from the EarlyBird timeline, Volkswagen Group itself tweeted the news release at 13:05. By this time Handelsblatt – a German financial daily news source – had discovered that Volkswagen was actually considering replacing Matthias Müller as chief executive, possibly with Herbert Diess, the head of the passenger vehicle division. At 13:14 Zerohedge tweeted this Handelsblatt story. EarlyBird identified this Tweet as likely to go viral, and so highlighted it as a Hot Tweet – which is why it’s in red in the timeline above. At this point the Volkswagen share price began to rise rapidly, so by the time Handelsblatt Global tweeted its own story at 13:23, the majority of the increase in the share price that day had already happened. Subsequently the New York Times (about an hour after the announcement), the Financial Times and the Wall Street Journal (+2hours), the BBC (+3hours) and CityAM (+5hours) all covered the story. But if you’d been using EarlyBird you could have seen the story break seven minutes before Reuters, 30 minutes before Handelsblatt and several hours before most other major news sources. Then you could have benefited from the 3% rise in share price that happened between 12:30 and about 13:40. If you’d not seen the story until after 13:30, you’d have missed the opportunity. 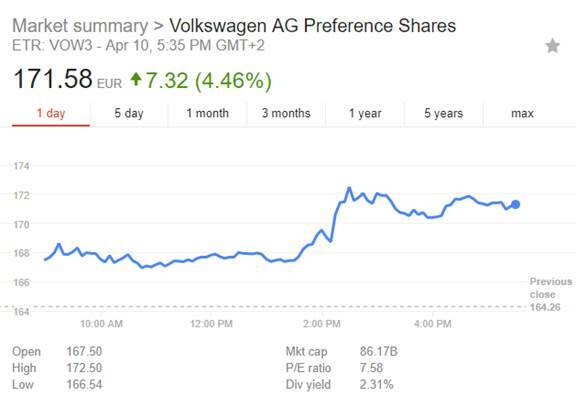 Volkswagen’s share price rose nearly 4.5% on the day. 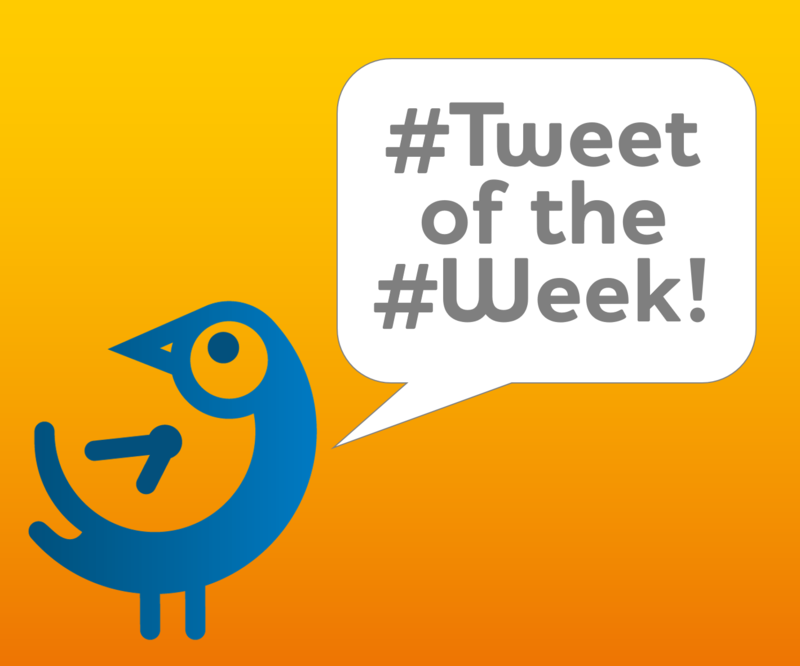 We know it’s easy to be wise with hindsight, but in this instance EarlyBird really did catch the word!